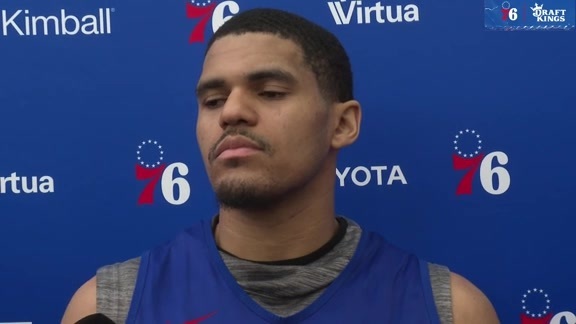 Back in Camden Tuesday for practice, the 76ers regrouped, and focused on how to grow some of the good from their first batch of gamess, while also addressing areas that need improvement. Prior to Sunday’s game in Brooklyn, which Brett Brown called an “outlier,” he had been encouraged by the club’s progress on defense. At the time the Sixers took the floor at Barclays Center, their defense was ranked seventh in the NBA (105.6 points allowed per 100 possessions). “I think that what we’re doing with our defense is trending in the way I want,” said Brown, who, throughout his six-season tenure, has made a philosophical habit of establishing new goals for every 10-game clump on the schedule. He’s also been pleased with the Sixers’ passing. Through 11 games, they rank second in the league with a 66.5 assist percentage, only 0.2 points behind Golden State. Where would Brown like to see the Sixers do better? Turnovers were an issue this past week, not just in Sunday’s outing against the Nets, when there were a season-high 27 giveaways. Brown also hopes the Sixers start making more shots. They’ve gone a combined 43.9 percent from the field overall, and 33.9 percent from 3-point territory. By and large, said Brown, Joel Embiid, with his 28.4 points per game (no. 2 NBA), has been shouldering the load of the Sixers’ offense, with JJ Redick (no. 3 NBA 36 3fg) a close second. And working on it, too. Three weeks into the new season, many Sixers fans by now probably realize that the team might be onto something good with Landry Shamet. The 2018 no. 26 pick has generated 13.6 points per 36 minutes, has hit 9 of 17 3-point attempts (38.3%), and provides reliable defensive play. Thanks to a “Rise Up” Election Day voting campaign launched by the National Basketball Players Association, even more people will now be introduced to the Wichita State product. Whatever you believe in, vote for it. “When we all vote, we make our voices heard,” Shamet says in the piece, before adding, “I think it’s important to get out and vote because you might think that one vote doesn’t make a difference, but it does.